I’ve had my iPhone for about six months now – it seems like I’ve had it forever and have no idea how I lived without it! I am still learning what all it will do and how to do it…..but am loving all the ways I use it now. I literally have a computer in my purse that goes with me everywhere I go and gives me access to whatever I need wherever I am! I get my emails, check my facebook, listen to my favorite music, access the internet, view my calendar, take great photos, instant message my buddies, keep a grocery list, post notes to myself……….oh, yeah – and I also make and receive phone calls!!! Not long after I got it, I made the comment that “it does everything for me but slice my bread……but, I’m sure if I look hard enough, I could find an app for that, too.”. APPS – short for Applications – are little icons you download onto your iPhone to link you to programs that do ANYTHING you want! 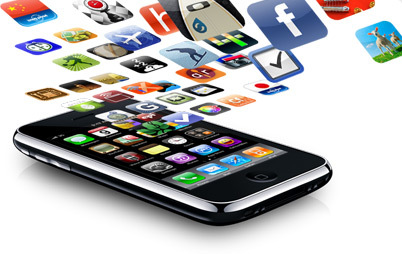 There are thousands and thousands of APPS available for whatever you need. I have 46 apps on my iPhone – most were free – I look for free ones! Some cost me 99 cents and the most I’ve ever paid for one was $1.99. I have a couple games, but mostly ones that are for referencing or searching for info – like the one that links me to “All Recipes” with the coolest search feature to find just the right recipe for any situation……and “Fandango” or “Flixster” to look up movies, view trailers, get reviews, show times, and other movie related info……..”TV Guide”, “AccuWeather”, a dictionary, “People” which lets me look up phone #s and addresses, a thesaurus, one that lets me search for the perfect quote for any situation, and even one that gives me the daily and archived “Bizarro” cartoons – I love Bizarro!!! I also have several that give me internet search options – Yahoo, Wikipedia, YouTube, E! Online, and more. I typically fly SouthWest, so I have an app to check my flight status and even lets me book a flight! I can connect to AOL, Facebook, WordPress, and LinkedIn! I can get maps and stock updates and nutrition info…..the world is at my fingertips!! I haven’t found one that will slice my bread for my, though……yet…..I’m still looking!!! But, what I have is just a drop in the bucket……..there is an APP for everything and every interest — there is even an APP called “iFart” – no, it won’t keep track of your farts – it is designed to give the user a wide variety of different fart sounds to play for the entertainment of their friends! Not my cup of tea, but it is actually a very popular APP – go figure! I love my iPhone…….I’m looking for more APPS I might enjoy — what are your favorite APPS and what would you recommend for me?